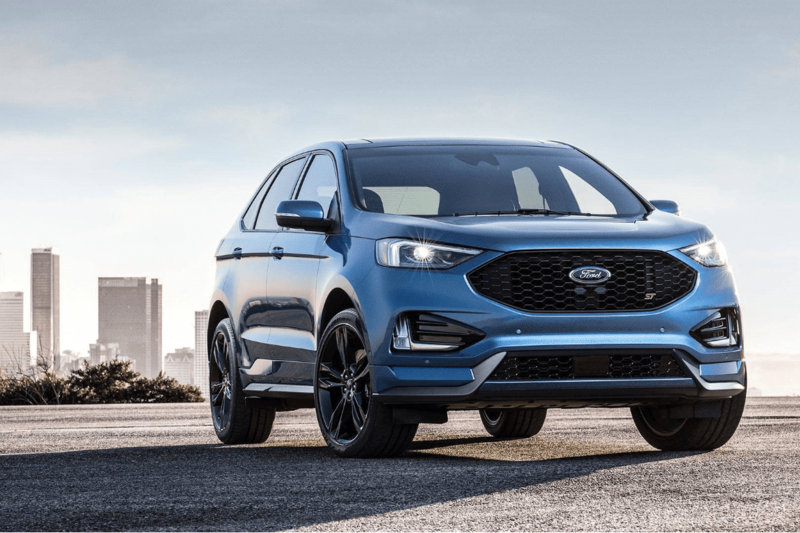 The 2019 Ford Edge ST is a sport-tuned and race-inspired performance SUV that’s all-new and replaces the Edge Sport. Power is derived from a 2.7L V6 EcoBoost motor that puts out 335 horsepower and 380lb-ft. of torque. That’s 20 extra horsepower and 30 more lb-ft of torque than last year’s Sport model. Pricing for the performance-oriented AWD 2019 Ford Edge ST begins at $43,350, and if you include the complete assortment of its performance-enhancing possibilities, that price pushes beyond $50,000. As part of the strong 2019 Edge lineup, the ST is designed to impress. Let’s put the 2019 Edge ST into Sport mode with an in-depth review of the first SUV ever from the Ford Performance Team. The 2019 Ford Edge ST provides all of the pickup, torque, and horsepower you will want to keep you in the fast lane. That is because it is powered by Ford’s dynamic twin-turbo 2.7-liter EcoBoost motor which comes with a light compact graphite iron engine block and aluminum heads. This lightweight powerhouse can crank out an impressive 335 horsepower and 380 lb.-ft. of torque and is the most powerful gas V6 engine in its class. Like the Focus ST and Fiesta ST models, Ford calls the Edge ST an “everyday performance SUV.” The Edge ST gets stiffer springs, shocks and anti-roll bars designed to deliver a firm but compliant ride. Ford insists this SUV is not a hard-nosed hotrod. There is also an optional high-performance brake system available (not a Brembo system). The Edge ST rolls with a selection of 20 or 21-inch tires and standard all-wheel drive. Just like other 2019 Edge versions, the ST will start with an extensive selection of standard safety features, such as automatic emergency braking, lane-keep assist, blind spot monitoring and much more, and new infotainment technology like FordPass Connect embedded Wi-Fi and the SYNC 3 AppLink, which supports the Ford+Alexa voice helper app. With its bold design, Edge obviously gets noticed. From the dynamic grille into the fluid shapes and smooth lines which run the length of its body, the 2019 Ford Edge ST will allow you to arrive in style. Additionally, it has a sleek roof, aerodynamic shape and the sort of commanding profile that is not afraid of turning heads or stepping into the spotlight. Edge has always had a daring, strong appearance. For 2019, the Ford has taken the Edge ST to a higher degree. More confident. More athletic. More accomplished. In the restyled body, grille, hood, and brakes to the LED tail lamps with amber turn signals and accessible 180-degree camera system, the 2019 Ford Edge ST is a design powerhouse. The overall craftsmanship and attention to detail can be seen both inside and out of 2019 Ford Edge ST. The interior features a standard leather-wrapped steering wheel with cruise, secondary audio and 5-way controls and leather-trimmed seats with Miko cloth inserts. Other smart touches include dual-zone electronic automatic temperature control, intelligent access with push-button start, BLIS (Blind Spot Information System) with cross-traffic alert and ambient light. The exterior design features a gloss black-painted mesh grille with ST logo and standard 20” bright-machined aluminum with high gloss black wheels. Also available are 21-inch premium gloss black-painted aluminum wheels. You will see the attention to detail everywhere you look within the 2019 Ford Edge ST. The quality and craftsmanship are reflected in how style and everyday usability come together in the sporty look and feel of the instrument panel, center stack, door trim, floor console, and new rotary e-shifter. The rotary gear change dial takes up less space than traditional gearshifts. This opens up space for more handily arranged cupholders, enhanced bin size, smart storage, and a USB port directly where you want it. The 2019 Ford Edge ST provides the most available driver-assist technologies in its own class to help give you confidence on the street. With cameras and detectors mounted in particular locations on the car, you can know about other vehicles and objects which are beside and behind you. For example, the optional enhanced active park assist system with parallel parking uses ultrasonic sensors on the front and back of the vehicle that will assist you parking your Edge ST into a suitable parallel or perpendicular parking space. In an increasingly crowded and stressful world, we can all use more optimism. The 2019 Ford Edge delivers a suite of smart driver-assist features designed to help you feel confident on the road. Available Adaptive Cruise Control with Stop-and-Go: Adaptive Cruise Control with Stop-and-Go can bring your vehicle to a complete stop when traffic slows and then speed back to a pre-set speed when things get moving again. Available Adaptive Cruise Control with Stop-and-Go and Lane Centering: Adaptive Cruise Control (ACC) with Stop-and-Go goes beyond conventional cruise control. If slower traffic is detected forward, your vehicle slows down also and then resumes the preset speed when traffic clears. Available Evasive Steering Assist: Evasive Steering Assist can help you avoid a possible collision with a slower-moving or stopped vehicle detected in front of you. It can offer steering support when there’s no time to avoid hitting something by braking alone. Pre-Collision Assist with Automatic Emergency Braking (AEB): This innovative feature can detect and help you stop a possible collision with pedestrians and vehicles in your forward path. The new 2019 Ford Edge ST offers more available driver-assist technology than any other midsize SUV in its class. Enjoy your personal sound studio, wherever you go. 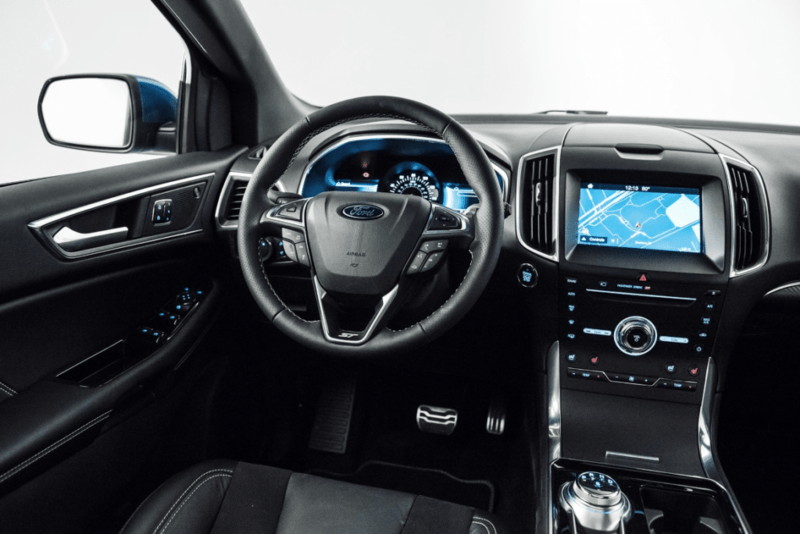 A 12-speaker B&O Premium Audio System by HARMAN is standard on the 2019 Ford Edge ST and offers a superior, immersive listening experience for everyone on board. Integrated to the 2019 Ford Edge ST rotary gear shifter, the Sport mode button activates sharper throttle programming and engine braking to get a more responsive driving experience. It may hold lower gears when cornering, and rev-matching helps boost engine RMP for quick downshifts. When drivers trigger that”S” button, they will delight in a louder exhaust note, and a tachometer automatically appears in the electronic instrument cluster to help quantify their performance. Other updates on the 2019 Ford Edge ST comprise of fully manual paddle shifters, a stiffer suspension, bigger vented rear rotors, and an optional performance brake package. This package provides enhanced friction materials and ventilation for the front rotors. Twenty-inch wheels are standard, but the performance brake package gets you 21-inch Premium Gloss Black-Painted Aluminum Wheels with summer performance tires. There are several cosmetic changes, too, including a larger grille with enhanced cooling, deep side skirts, and dual-exhaust outlets. Take the 2019 Ford Edge ST and put it into Sport mode and a thrilling ST drive experience begins. Cluster/Paddle shifters – Shifters allow for complete control of the transmission during spirited driving, as the all-digital parts of the instrument cluster can switch to display a tachometer. Engine sound – Enhanced active sound control provides a more engaging noise in the cabin. Engine response – Revised electronic throttle programming provides more responsive feel, and sharp engine braking aids provide vehicle deceleration prior to a corner. Transmission – The 2019 Ford Edge ST has an aggressive mapping that holds gears in peak engine performance, upshifts tuned for rapid gear change to maximize vehicle acceleration, rev-matching to raise engine RPM, along with a specially tuned shift scheduling algorithm that adjusts based on driving style and road conditions. You don’t need to learn how to drive a manual transmission or find out how to master a clutch to enjoy the sporty sense of shifting gears. Using race-inspired technologies, the steering wheel-mounted paddles offer an engaging driving experience by allowing you to quickly and easily move from gear to gear without taking your hands off the wheel. The 2019 Ford Edge ST incorporates power, performance, and handling with technologies that inspire confidence behind the wheel. The first performance SUV from Ford has the features and capabilities that will assist you in multitasking your way through the challenges of career, family and everything else that pulls you into various directions. Note the Intelligent AWD (standard on Edge ST), the electrically power-assisted steering and the spacious 39.2 cu. 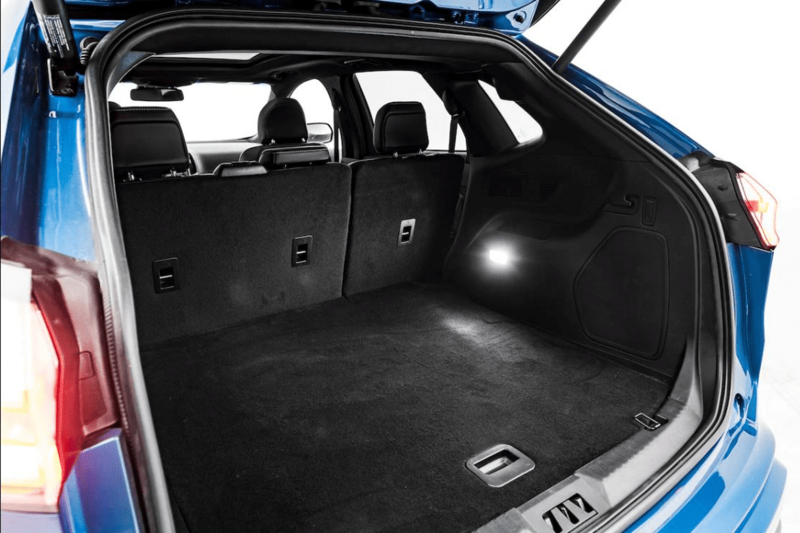 Ft. of cargo space behind the second row. Intelligent AWD uses sensors to continuously monitor grip, helping you through various kinds of weather and road conditions. It balances torque between front and rear wheels to improve handling and optimize grip, typically before wheel slip can even happen. The 2019 Edge SUV will be the first Ford that delivers an AWD system that can detect different driving conditions and seamlessly switch between full front-wheel and all-wheel drive so. Ford calls this system all-wheel drive disconnect, which will come as normal for the performance-focused 2019 Edge ST as well as a substitute for other 2019 Edges from the line-up. Obvious advantages of this system include enhanced traction and fuel economy. Using artificial intelligence and data received from dozens of detectors, Ford claims the machine can detect wheel slip, traction control if the windshield wipers are on if the Edge is towing a trailer, as well as the outside temperature. According to Ford, an algorithm which uses”fuzzy logic” uses data to ascertain whether to participate all-wheel or front-wheel drive, which takes 10 milliseconds to detect. Up to 100 percent of the available power can be distributed from the front to the rear wheels depending on driving conditions detected by the system. In addition to improving stability and traction, Ford’s all-wheel-drive disconnect also improves fuel economy. With regular all-wheel drive and a 2.7-liter V6 EcoBoost motor, the 2019 Ford Edge ST has EPA-estimated fuel economy ratings of 19/26/21 mpg city/highway/combined. Standard on 2019 Ford Edge ST, the Class II Trailer Tow Package (AWD required) has a maximum towing capacity of 3,500 lbs. Trailer sway control can help you tow by automatically determining from the movement of the car if the trailer is swaying. It then takes steps, like applying accurate braking or reducing engine torque, to help maintain both the car and the trailer in check. Paying over $40,000 for an American crossover is very likely to make some folks balk, but Ford is determined the 2019 Ford Edge ST will end up being a true rival for crossovers offerings from Audi, Mercedes, and Porsche. Time will be the determining factor on that one though.